Prominent & Leading Manufacturer from Mumbai, we offer pp woven fabric on sulzer loom and fabrics made on circular looms. 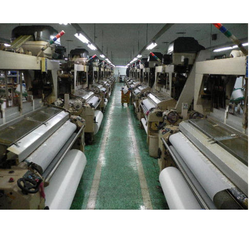 PP Woven Fabric on Sulzer Loom is available in flat form with wide usage in making packaging bags for varied industries. Available in different colors and wide range of weights, these fabrics are best to use for making tarpaulins and wrapping steel coils. Made on Circlur looms is widely used for packaging purpose in several industries. In addition to this, these woven fabrics are also used in automotive industry for covering the tempos, trucks and other loading vehicles. UV treated for weather proof finish and long life, these PP woven fabrics are also used for making food grain bags, cement bags, polymer bags and valve bags.